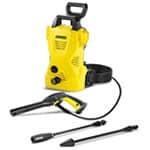 Hand held electric pressure washers are the smallest, most light-weight pressure washers we carry. You just plug it into a household outlet and start cleaning. Because of their small size, you can easily store them on a garage shelf. They're perfect for washing your car, cleaning outdoor furniture and things like grills. If you plan on tackling bigger jobs, hand held units will take a long time, so jump up to a more powerful category. The next step up for consumer grade units is medium electric pressure washers. The biggest benefit over hand held units is you can pull them around, making it easier on your arm. Again, you just plug it into an outlet and let the good times roll. You can use these to clean small patios or balconies. If you're going to be pressure washing all the siding on your home or cleaning a large deck, look for a more powerful unit. 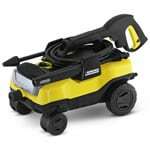 Large electric pressure washers really up the ante with performance and features. They're on wheels for easy portability, have better motors and offer other perks, such as on-board detergent tanks. If you plan to remove moss, clean small patios, decks or walkways, large electric pressure washers are up to the task. If you opt for an electric-powered consumer unit, our extra-large power washers offer the most bells and whistles. 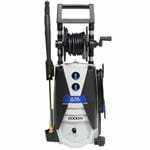 In addition to higher PSI ratings (as much as 2000), these pressure washers boast higher-quality pumps, motors and features such as hose reels and detergent tanks. 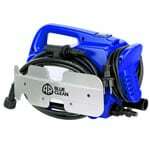 X-Large electric pressure washers can take on decks and patios much quicker than the other electric units. With the better pumps and motor, you will get more hours of cleaning out of the unit. If this still isn't enough power, look to our gas-powered units. Consumer Electric Pressure Washer Buyer's Guide.. Our Power Equipment Direct how-to library can help you learn about Proposition 65 Product Labeling, Sales Tax Information and Product Recalls for Pressure Washer Equipment.